Check out the best eating and drinking on Sawtelle Boulevard with our LA city guide to the the area's new wave of restaurants. Downtown's Little Tokyo may have a 75-year headstart on Sawtelle Boulevard, the West LA enclave between Olympic and Santa Monica Boulevards known as Little Osaka. 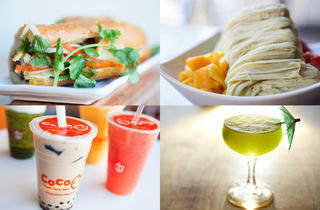 But amongst the bevy of stores and restaurants in the area a spate of restaurants have recently opened. This new crop of culinary contenders complement existing classics, turning the primarily Japanese restaurant row into a collective dining destination. 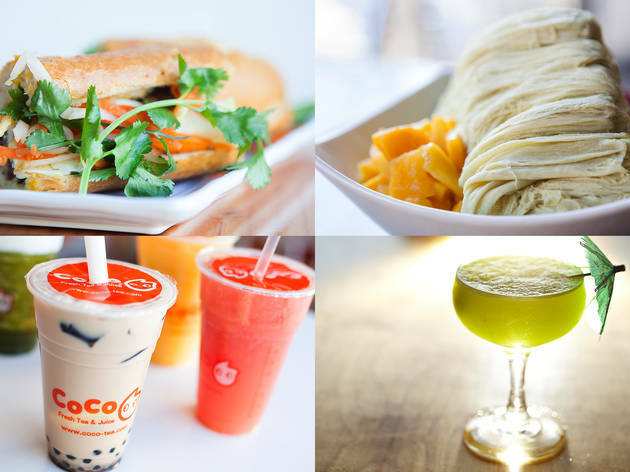 Here's your LA city guide to the best eating and drinking on Sawtelle Boulevard. Chef Ernesto Uchimura has moved beyond burgers, to an extent, since his Umami Burger days. 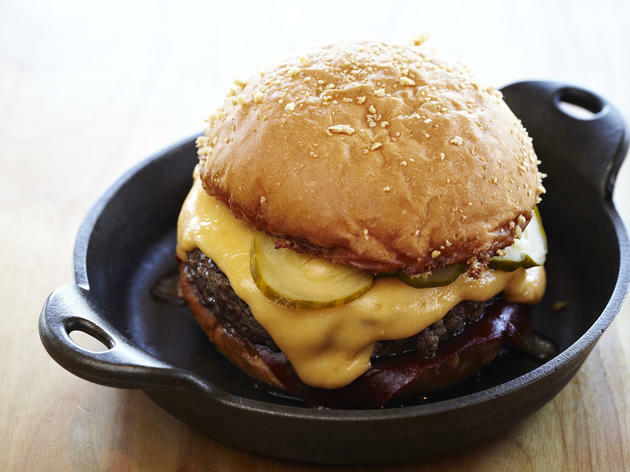 But now the former executive chef of the chain is part of the city's new burger-focused eatery. 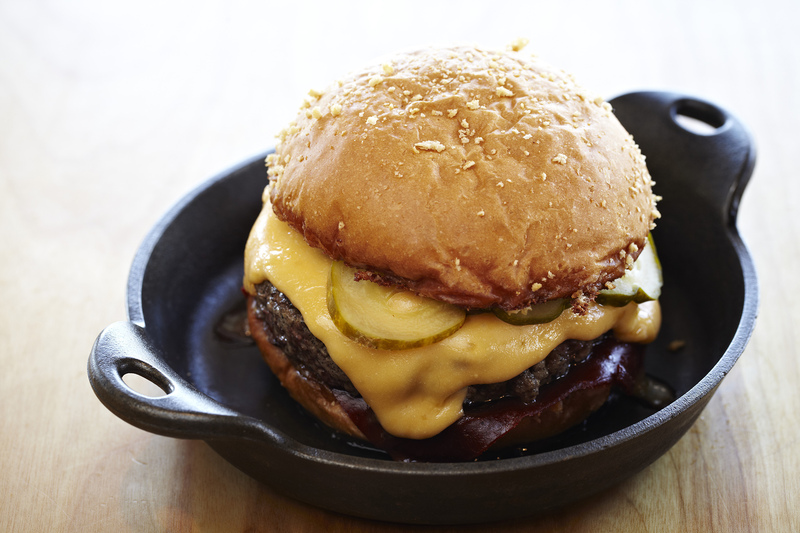 Dig into the PCB, aka Plan Check Burger ($11), layered with dashi cheese, caramelized schmaltz onions, pickles and ketchup leather, or upgrade to the Habanero Cheeseburger ($13), with spicy and smoky chile cheese and bacon. 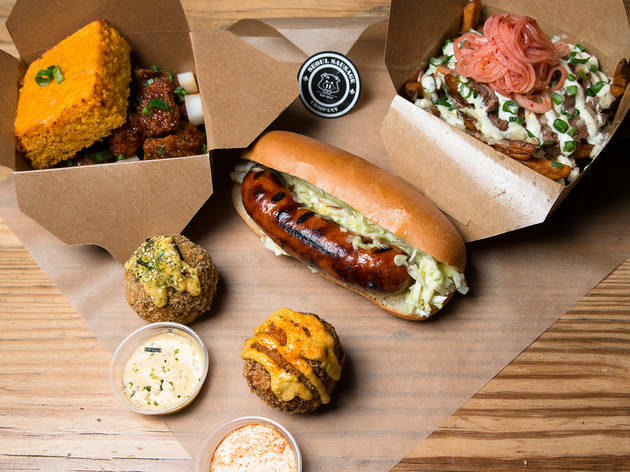 Other standout dishes include Smokey Fried Chicken ($13)—crispy-coated Jidori chicken with smoked milk gravy, sweet yam preserves and spicy pickled okra in a cast iron skillet. Sure, there are salads, but why not pile on gut-busting comfort foods like Pastrami Nosh ($12), starring double-rubbed and double-smoked pastrami plated with molten Swiss cheese, kimchi mustard, pickles and a fried egg, and, for people who have the intestinal fortitude for dessert, cruller donuts ($6) fried to order. The bar offerings are equally tempting with Julian Cox-designed cocktails—try the bourbon and plum wine-mixed Little Osaka Sour ($12)—beers by the bottle and on tap and an extensive selection of Japanese whiskeys. 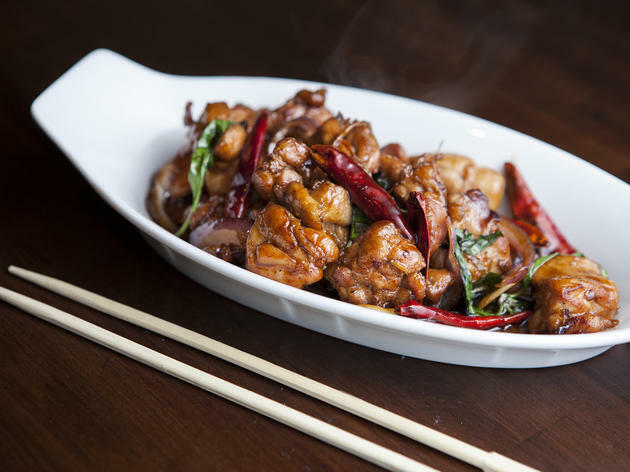 While ROC typically refers to the Republic of China, this Sawtelle newbie offers the tastes of the Republic of California, translating to seasonal and enlightening touches on a Chinese menu. 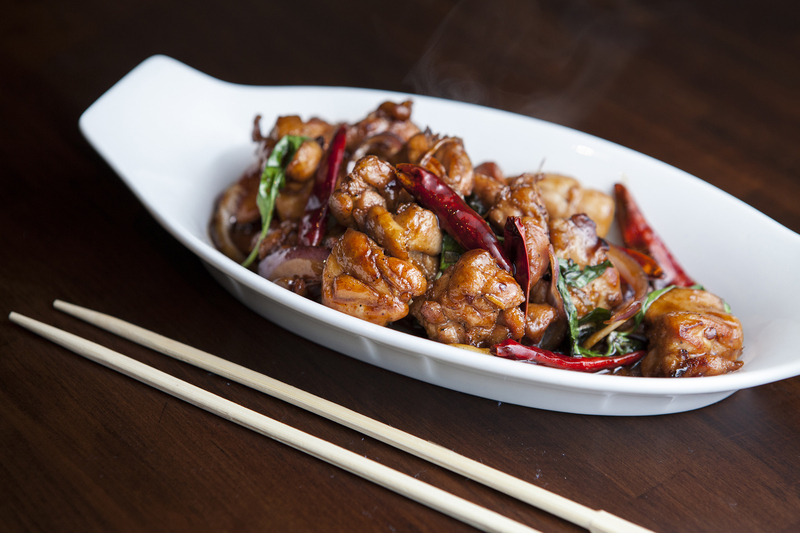 Dishes include the fairly traditional—three-cup chicken ($14) features juicy dark meat bathed in soy sauce, rice wine, sesame oil, roasted garlic, fresh chiles and Thai basil—and relatively nouveau, such as spicy sautéed shrimp and shishito peppers ($15). Dumplings are also on offer, from crispy shrimp and pork—griddled discs resemble flying saucers—to soup dumplings (pork, $7; crab, $9.25), a rarity on the Westside. 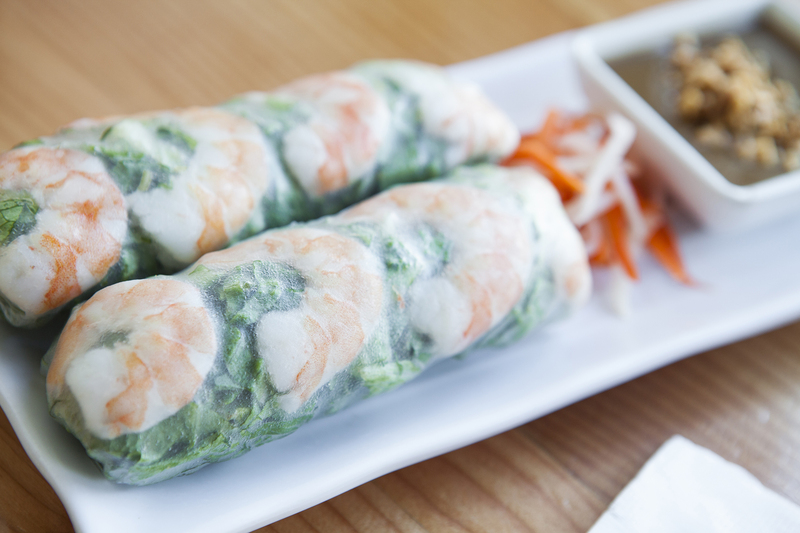 Nong Lá fills a gaping Vietnamese gap on the Westside. Minimalist wooden tables and countertops and black-and-white photos set the modern space, while comforting classics such as pho are served by the bowlful. 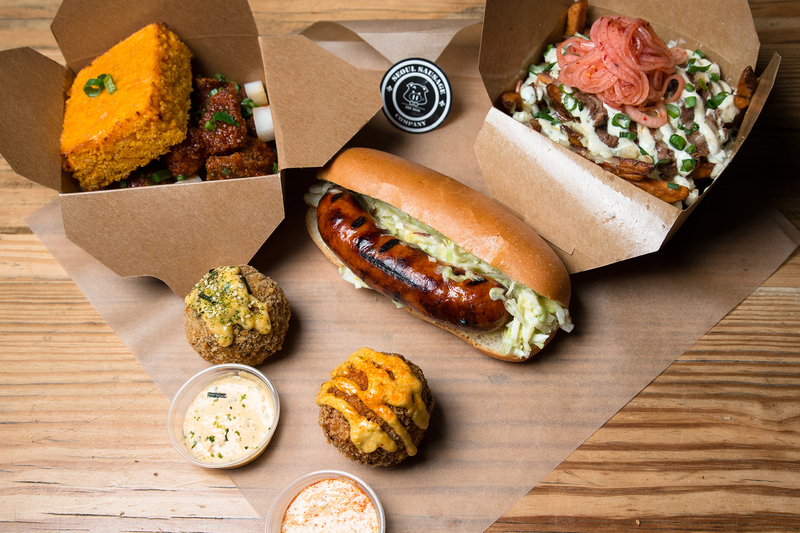 Choose beef—toppings vary from beef ball and thinly sliced rare steak (both $7.95) to an everything version ($8.50) of steak, brisket, beef ball and tripe—or chicken ($7.95), featuring free-range chicken and broth seasoned with cinnamon and cloves. Each bowl comes with a side of Thai basil, bean sprouts and a ginger-garlic-chile dipping sauce. Other favorites include banh mi (8” baguette for $5.50, 12” baguette for $6.50) and bun ($7.95), rice vermicelli noodles served with cucumbers, carrots, daikon, bean sprouts, lettuce, cilantro and peanuts and topped with meat toppings. 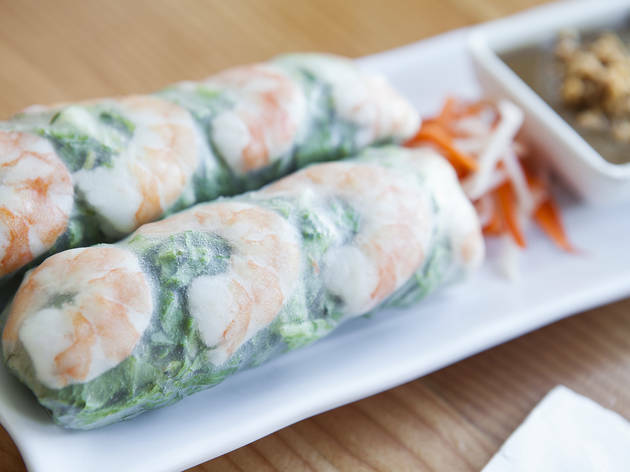 Of particular note are the bo nuong cha gio, also served as an appetizer; these crispy egg rolls are filled with ground pork, shrimp, carrots, glass noodles and shallots. 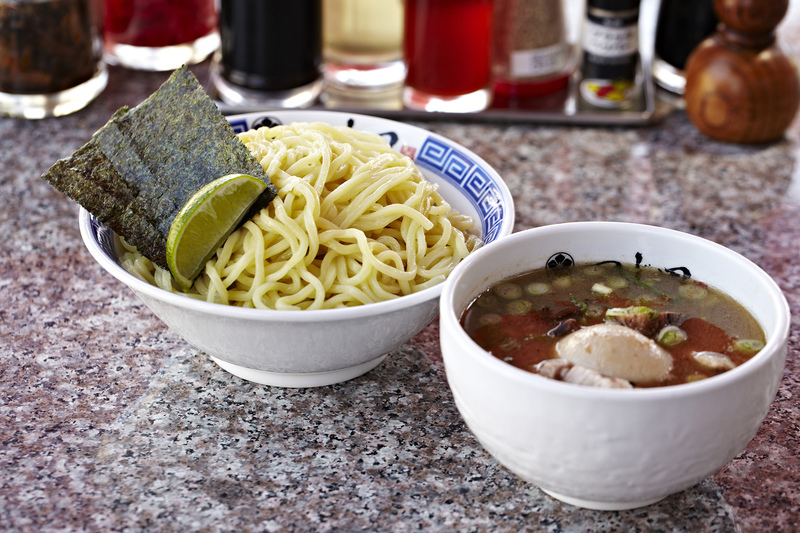 When Tsujita opened in 2001, ramen had already gained traction in LA, but this Sawtelle storefront took the soup noodles to another realm and introduced Angelenos to tsukemen. 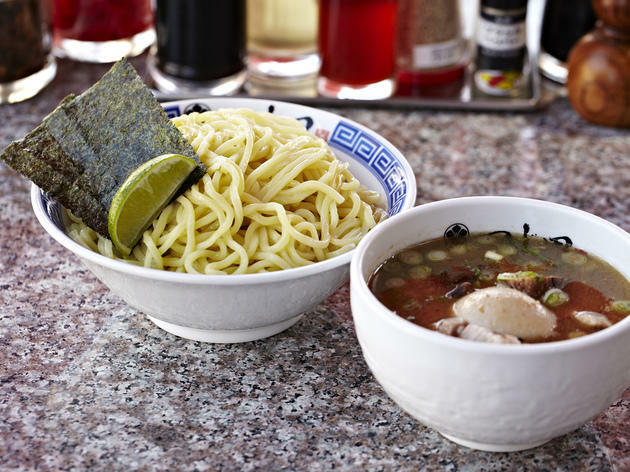 Also known as dipping ramen, these thick, springy noodles are served alongside broth—porcine-rich tonkotsu soup that simmers for 60 hours and combines with seafood for savory complexity and a blast of umami. 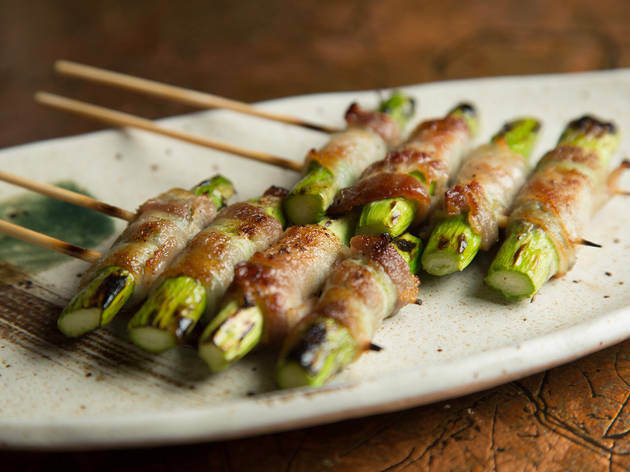 The lunch-only (for now) options include basic ($9.95) or topped with char siu pork ($10.95), double pork ($13.95), scallions, mushrooms, nori or soft-boiled egg. 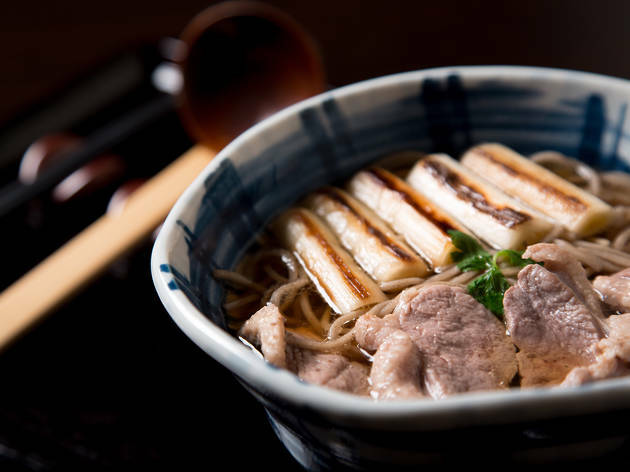 Tsujita switches up offerings entirely at dinner, with a varied menu of refined Japanese comfort food that includes ox tongue stew, a spicy hot pot with sliced pork and winter vegetables or seared, vinegar-soaked saba. There’s also beer, wine, sake and soju cocktails crafted with fresh fruit. Chef Chris Oh and brothers Ted and Yong Kim operate this contemporary Korean-inflected sausage parlor with a decidely party vibe. The loft-like space houses a DJ deck on the mezzanine and a colorful wall mural declaring “Make Sausage Not War.” The trio lapped the field on The Great Food Truck Race with their handmade sausages of spicy pork—the ground meat is also showcased in the creative, arancini-like Flaming Ball ($3)—and kalbi ($7), served with garlic-jalapeño aioli and kimchi relish on a toasted roll. Specials further riff on recognizable favorites like Da KFC ($8)—crispy chunks of thigh meat are dredged in semolina and panko and topped with scallions, carrots, daikon, tangy chile sauce and a sweet square of cornbread and Sriracha honey butter drizzle—and galbi poutine ($8), piles of crispy fries with juicy pulled short rib meat, cheese, avocado-lime crema, pickled onions and scallions. Chef Mako Tanaka presided over the now-shuttered Mako in Beverly Hills for years and now brings the same cutting-edge vibe to his new Sawtelle restaurant with daring ingredients such as fugu. 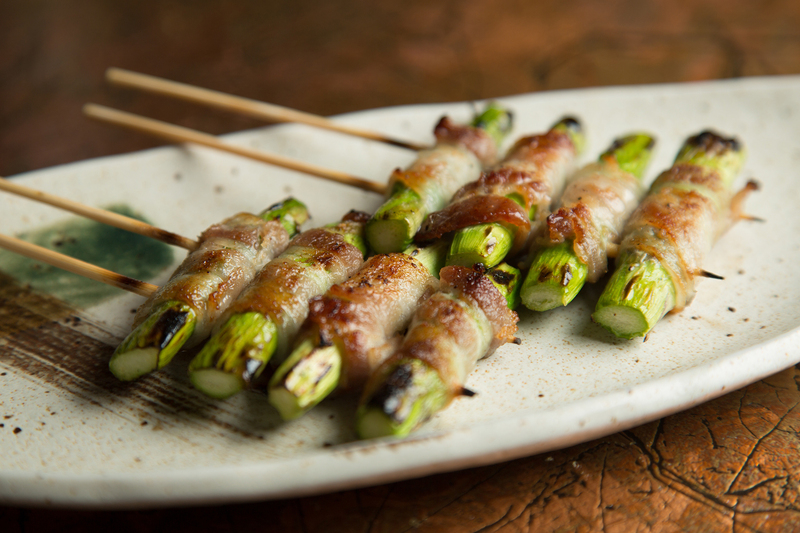 But at the core of Robata-Ya’s culinary program is the robata, an open charcoal grill where skewers of Kurobuta pork, veggies and chicken—namely, Jidori chicken, including liver, breast meat, meatballs, skin and even bone—are grilled to order. Don't miss chicken oysters ($2.50) with crispy skin and savory teriyaki sauce or the spicy meatball ($2.75) with a ginger kick. Lunch is prime time to get your bang-for-your-buck bento-box fix (chicken, $10; filet mignon, $12)—thin-skinned chicken gyoza, delicate vegetable tempura, miso soup, salad, spicy tuna roll and, of course, more skewers. Teenagers, families and sugar hounds alike flock to this perpetually packed emporium for "snow cream"—Hawaiian shaved ice meets ice cream in layers of icy ribbons. Start with a base flavor from original and black sesame to seasonal mango and avocado, then choose your own adventure with toppings from boba to brownie bites and "drizzles” such as condensed milk and chocolate sauce. The blackboard menu guides you through the three-step, build-a-bowl process and lists favorite house combos. 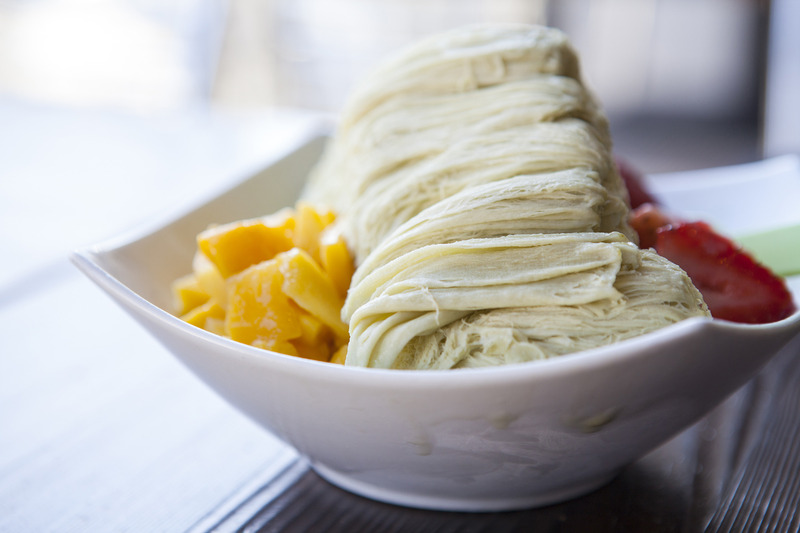 We love green tea snow cream with red bean, chewy mocha (rice cakes) and sweet condensed milk. 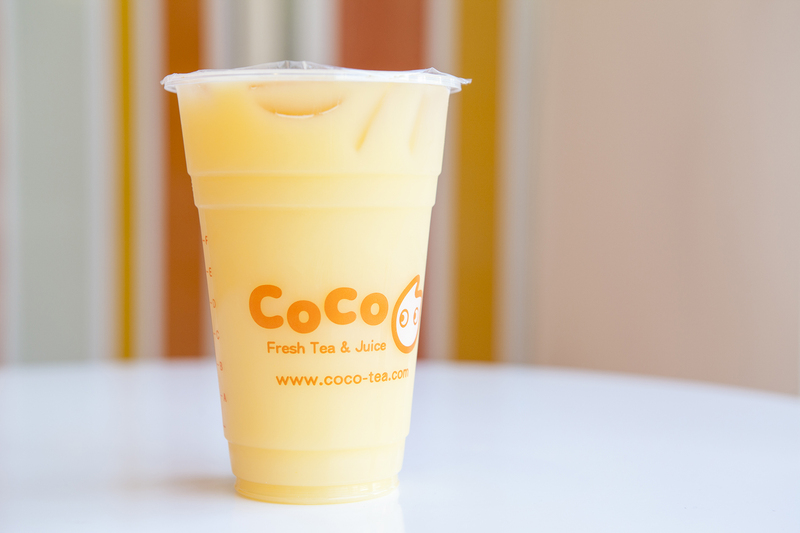 Boba isn’t new to Little Osaka, but CoCo’s first-time take on freshness is. This tiny storefront of the Taiwanese chain makes new batches of boba every four hours, new brews of black tea every two hours, freshly-squeezed juices and housemade jellies. The extensive menu offers teas from milk to fruit-flavorered. 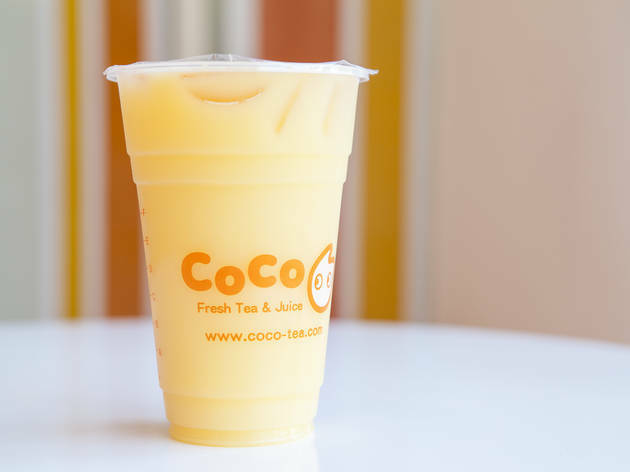 Try grapefruit green tea made with soft tapioca pearls and pulpy Texas Red fruit juice or passion fruit green tea, tart and sweet with firm coconut jellies. 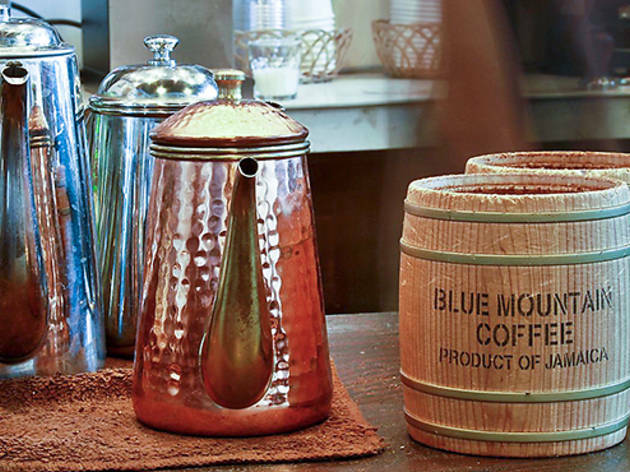 Little Osaka’s most ambitious specialty coffeehouse declares its intentions at the door: With a red, Dietrich roaster and canvas coffee bags that greet you upon entering, you know that they take coffee seriously here. 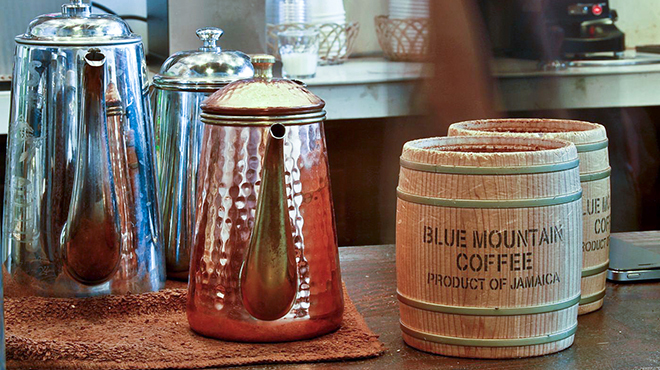 Coffee beans are roasted in-house and baristas live up to the billing with La Marzocco GB/5 espresso machine and a four-cone pour-over bar. Signature beverages include the Tomo Latte—tomo translates as "friend" in Japanese—sweetened with condensed milk and non-coffee drinks such as sweet potato latte and red bean latte. Other unique items include housemade pretzels—crab claw-shaped breads baked with stringy mozzarella and offered plain or filled with flavors such as sweet potato cheese or red bean. 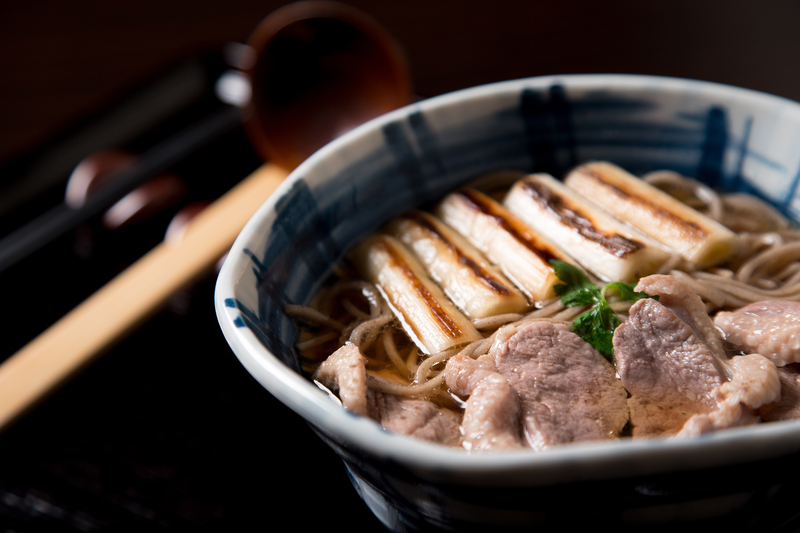 Ramen gets all the hype, but soba—Japanese buckwheat noodles served hot or cold—satisfy another, unsung, niche for noodle fanatics. The Japanese chain's second US outpost—the first opened its doors in Torrance last spring—features an open kitchen, L-shaped bar outfitted in red, black and white tiles and red drum-shaped lanterns. Sojibo’s menu is varied, including “Quick Bites” such as fried gobo (burdock root) sticks and an entire section devoted to kushiage (deep-fried, panko-crusted skewers). But the main draw is clearly soba, nutty, housemade noodles. Start simply with zaru soba ($7), cold nori-topped soba appears on a plastic mat with dipping broth that benefits from scallions and wasabi, served alongside. Upgrade with versions served with jumbo shrimp, sliced duck and, if you’re feeling adventurous, natto (fermented soy beans). 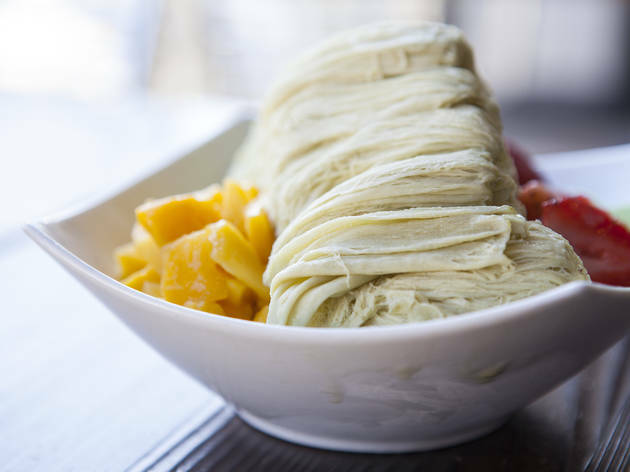 Dessert is uncomplicated—choose vanilla, green tea, black sesame, lychee-flavored ice cream by the scoop ($2) or deep-fried, tempura-battered ($5).